Ray modern turkish carpet, mechanical frame with Composition 100% Polypropylene. Ray modern carpet in Anatolia frame, Processing in Turkey rectangular carpet worked with mechanical frame and hand finished with Composition 100% Polypropylene, short fleece with a thickness of 13 mm and density of 1.65 kg for MQ. and total weight of 3 kg for each MQ. Background material in Juta. Available sizes 300x200 - 230x160 - 190x133, and four different designs and colors. Professional washing with water, cleaning and maintenance with Vacuum cleaner. Free delivery: from 1 to 3 working days. 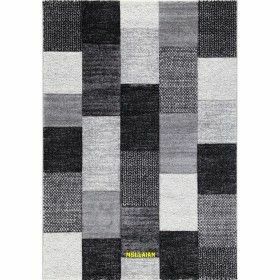 Ray Grey Black modern turkish carpet, Gray black colors, mechanical frame 100% Polypropylene. Ray Grey Red 02B modern turkish carpet, Gray red colors, mechanical frame 100% Polypropylene. Ray Grey Red B modern turkish carpet, Gray red colors, mechanical frame 100% Polypropylene. Ray beige Brown modern turkish carpet, Gray, Taupe colors, mechanical frame 100% Polypropylene.